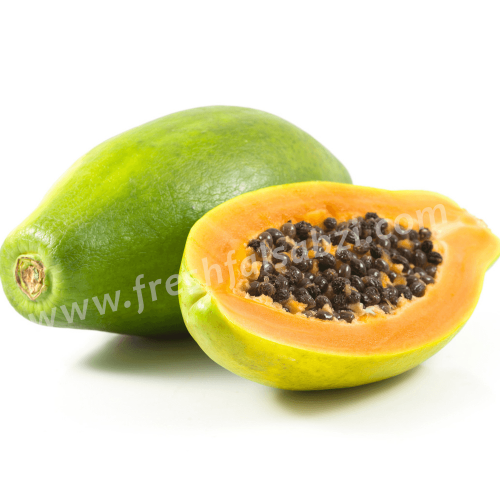 Papaya includes thin smooth skin dark green in color when undeveloped, which changes to orange or bright yellowish, as it ripens. It includes a delicious, succulent orange flesh sometimes with pink or yellow hues. Inside the internal cavity of the fruit are numerous black, round seeds covered in a gelatinous-like substance (some varieties are seedless). Benefits : Papaya helps cardiovascular health by controlling homocysteine levels in the bloodstream, high levels of which can damage blood vessels, and lower undesirable LDL cholesterol. It is very beneficial to those with enzyme deficiencies or with low stomach acid output, which is common with age. It can be useful for most gastrointestinal ailments; from easing indigestion to enhancing the body’s defense of colon cancer and also help with ulcers. It contains vital nutrients including potassium, magnesium, and vitamins A, C, E and B.